Sheep are essentially helpless and as domesticated animals go, sheep are honestly pretty much the most helpless. For instance, sheep can spend their entire day grazing in the pasture, going from place to place, never looking up causing them to often become lost. In contrast, if you have a cat or dog that gets out of the house, what do they typically do? (besides run around) They typically eventually try to find their way home. Sheep on the other hand don’t have this instinct like other animals do. They are totally incapable of finding their way to their sheep pen / fold even when it is in plain sight. Sheep are also very susceptible to injury and cannot defend themselves against predators such as wolves. In ancient times and even today, wolves were/are the main predators of flocks of sheep. Another interesting fact is that if different flocks of sheep somehow get mixed together at a watering hole or somewhere, the only way to separate the flock would be for a shepherd to call out to his sheep. Then, even as helpless and inattentive they are as animals, they would hear and recognize the shepherd's voice and follow him out amongst the other flocks. The sheep knew the voice of the shepherd and the shepherd knew his sheep. The shepherd was their safety and a true shepherd would go to great lengths to protect them when faced with danger, even giving their lives for the sake of the flock. Shepherds were the providers, guides and protectors of the sheep and the sheep were completely dependent on the shepherd. It's clear that in a very practical sense, while we have more common sense (hopefully) and wisdom than the animal type of sheep, we are in many ways like helpless and hopeless sheep. We need a True Shepherd to lead us! Jesus is The Good Shepherd and as The True Shepherd, He laid down His life for you and I so we might have life. He gave His life on the cross as “The Good Shepherd” for you and through His sacrifice, He made salvation possible for all who confess, repent, believe and receive Him in Faith. I pray that you are a part of His flock! -calls His own sheep by name. -leads and He gathers His sheep. -His sheep know His voice. -His sheep seek His protection and direction. -sacrifices His life for His sheep voluntarily. -He is The way of salvation. -He is truly The Good Shepherd! Today... there exists wolves/predators of a different kind that seek to either lead His flock astray or devour them with false teaching. Either way, they want to lead His sheep out of His flock or keep them out of His flock all together. 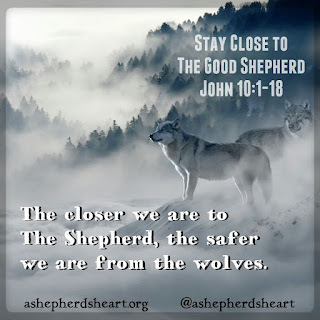 No matter what, let me encourage you to stay close to The Shepherd as the closer you are to The Shepherd, the safer you are from the wolves and there are many wolves in the world we live in today. He loves you unconditionally and wants to lead you through this journey called life! 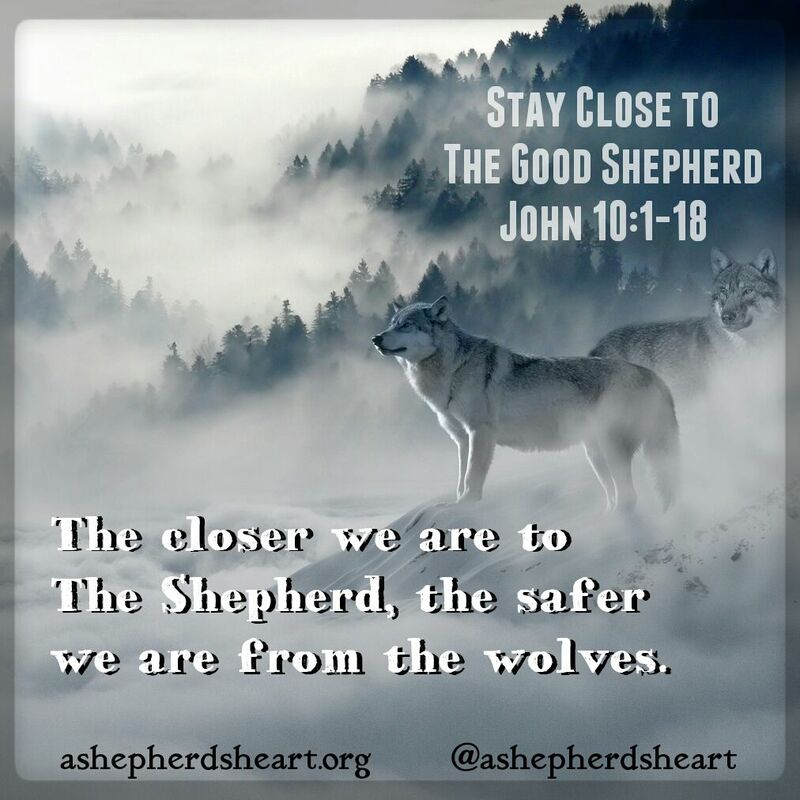 Stay close to The Good Shepherd! P.S. Please share this post with someone today!